The Flags of Our Heroes Program enables us to show the respect so richly deserved to our deceased veterans and their families. We want to provide these families with the knowledge that their family member was honored with the highest regard and dignity at the appropriate National Memorial in Washington, D.C. In order to do this, Honor Flight Syracuse requests that the family and/or friends of the deceased veteran loan Honor Flight a 5 x 7 photo of the veteran and a copy of the obituary notice, if available. 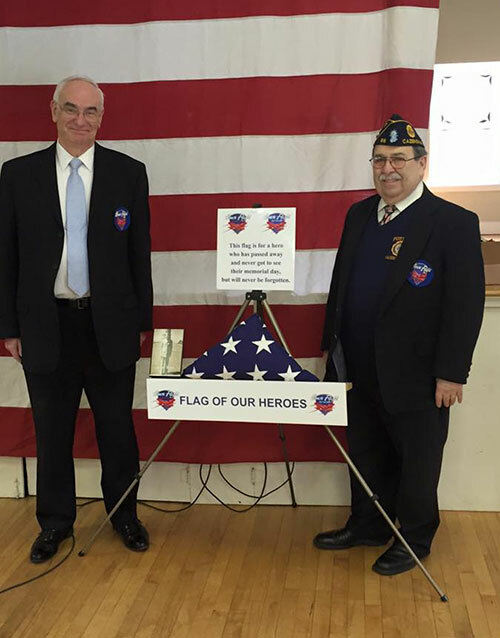 A flag of a deceased War Veteran has been donated, and is taken along with your veteran’s photo on one of our missions to the Memorials in Washington, D.C. The flag and photo are placed in front of the appropriate Memorial and a photo taken. In a solemn ceremony several weeks after the Mission your family will receive an 8 x 10 photo and a formal certificate from Honor Flight Syracuse honoring the veteran and their participation in spirit with us on the recent Mission. All items taken to Washington are returned to the family after the trip. If you are interested in honoring a deceased veteran from your family in this way, please contact us here, or contact Tom Shaw directly at the phone number or email below. We deeply appreciate your veteran’s service to our Country. We will be honored to commemorate your veteran’s service through the Flags of Our Heroes Ceremony. Telephone: (855) 433-5633 OPTION 5.